Custom embroidered basic crew sweatshirts feature 9 oz, 10 oz, 11 oz and 12 oz blends. All custom embroidered with your logo included in price! Heavyweight, reverse weave, nublend fabrics by Jerzees, Hanes, Port Authority, Champion, Sport Tek and Port & Company. Custom embroidered with your company logo. Custom embroidered JERZEES ® - NuBlend ® Crewneck Sweatshirt. 562M. 8-ounce, 50/50 cotton/poly NuBlend® preshrunk pill-resistant fleece. High-stitch density for a smooth-printing canvas. Coverseamed neck, armholes and waistband. Rib knit collar, cuffs and waistband with spandex. Seamless body with set-in sleeves. Ash (formerly Birch). Custom embroidered logo included.Youth Sizes Available! Custom embroidered G180 Gildan 7.75 oz. Heavy BlendT 50/50 Fleece Crew . 50% cotton, 50% polyester; pill-resistant air jet yarn; double-needle stitching throughout; 1x1 ribbed collar, cuffs and waistband with spandex . Custom embroidered logo included. Port & Company ® - Crewneck Sweatshirt. PC90. Custom embroidered Port & Company ® - Crewneck Sweatshirt. PC90. Traditional crewneck silhouette that's perfect for the gym or relaxing. 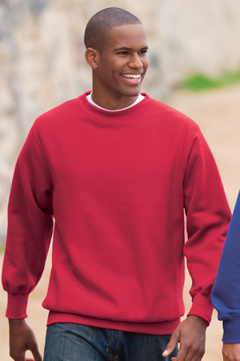 9-ounce, 50/50 cotton/poly fleece , Coverseamed crewneck, arm seams and waistband , Spandex in collar, cuffs and waistband , Set-in sleeves. Tall & Youth Sizes Available! Custom embroidered G120 Gildan 9.3 oz. DryBlendT 50/50 Fleece Crew. 50% cotton, 50% polyester; pill-resistant air jet yarn; double-needle stitching throughout; 1x1 ribbed collar, cuffs and waistband with spandex . Custom embroidered logo included. Custom embroidered 4662 Jerzees 9 oz 50/50 Super Sweats Nublend Basic Crew Sweatshirt Heavyweight 50/50 crew neck sweatshirt with NuBlend pill-resistant fleece (Oxford is 55/45 poly/cotton). Ribbed collar, cuffs and waistband. Radici-Spandex in ribbing. Fully coverseamed. Custom embroidered logo included. Custom embroidered S600 9 oz., 50% cotton, 50% polyester Eco® fleece fabric is soft and durable. Made with up to 5% polyester from recycled plastic. Coverstitched seams throughout for better durability. Sideseamed construction won't twist and bind. 1x1 rib with spandex at cuffs and waist won't sag over time. "C" logo above left cuff - the mark of true athletic performance. Custom embroidery included. 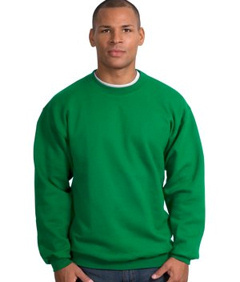 Hanes® Ultimate Cotton - Basic Crew Sweatshirt. F260 (bb) 10 oz. Custom embroidered 10 oz. 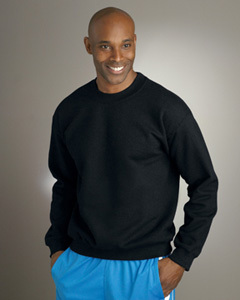 Hanes® Ultimate Cotton - Basic Crew Sweatshirt. PrintPro XP® low pill, high stitch density fleece. Top quality and a customer favorite. Fully coverseamed, Spandex in collar, cuffs and hem, Set-in sleeves, Custom Embroidery included. Custom embroidered Sport-Tek® - 12 oz. 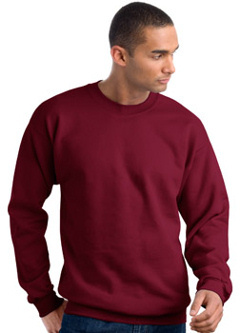 Super Heavyweight Basic Crew Sweatshirt. F280. The most warmth you can get out of a sweatshirt. Our super heavyweight fleece is built for unparalleled comfort. 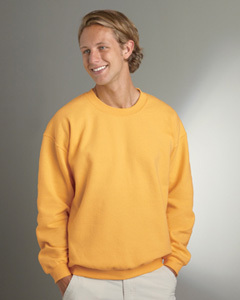 12-ounce, cross-grain 80/20 ring spun combed cotton/poly, Twill taped neck, 2x2 rib knit crewneck, cuffs and hem with spandex, Rib knit side gussets, Custom embroidery included. Custom embroidered S1049 Champion 12 oz Reverse Weave Fleece Basic Crew Sweatshirt. 82% cotton, 18% polyester (Silver Grey is 81% cotton, 17% polyester, 2% black rayon). 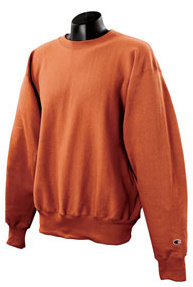 Extra-heavy low-shrink fleece; ribbed neck; side gussets; locker loop; full athletic cut; 3 3/4" ribbed cuffs and waistband; "C" logo above left cuff. Custom embroidery included! Super Heavyweight Fabric with Bolder Color!